Many students start forgetting what we’re teaching about 10 minutes after we start. And by 15 minutes in, there’s a good chance we’ve lost about half of them, no matter how attentive they look. It’s just too hard for their (and our) brains to concentrate on anything for long while being passive (Middendorf and Kalish, 1996; Fedder and Brent, 2016). In my view, fighting the forgetting process is an integral part of teaching. 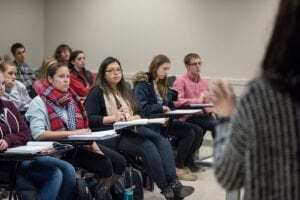 What we have do is use active learning activities–anything except a lecture or demonstration during which students are supposed to just watch and listen. Active learning activities interrupt the forgetting process by engaging our students’ brains at the moment and also strengthen the paths in students’ brains through which they can later recall what we’ve taught them. I’m making a list of such activities—what I’ve read research about and then had luck with myself–and thought I’d share some with you in exchange for some of yours. I hope you’ll post descriptions of ones you’ve used to this blog and help us all. I’ve grouped the activities below by the terms psychologists associate with them. As you’ll see, many of the examples provide students the opportunity to recall and organize what they’ve learned. Generation: Students learn more if they are answering questions, solving problems, and testing theories on their own, rather than being given the information. Being on their own seems to introduce “desirable difficulties” that help students generate their own grasp of the material. Remember to let students know we expect mistakes and that making mistakes is important and okay. 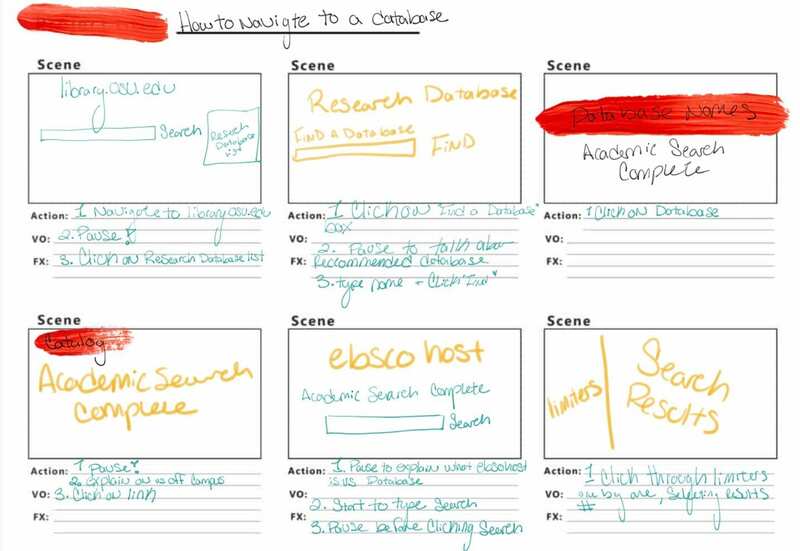 Example: If we’re going to teach how to use a particular database in someone else’s class, we can ask him or her to assign students to locate that database the night before. Even students who are unsuccessful will learn more. Once there, we can use a handout to help those who were unsuccessful quickly find the database. Example: Getting blank looks when you ask, “Do you have any questions?” or even the better “What are your questions?”? In our A+ Research presentations we instead ask them to quickly pair up and give them 3 minutes to come up with two questions. Then my student assistant answers them. It works every time. Next year we’ll have each student e-mail me with one of their questions. Research indicates that once they do it, it will be easier for them to email me for help later on. Example: When teaching face-to-face with a class, I casually tell students there will be a quiz, even when all I plan is a review at the end during which I’ll ask them questions orally. Research shows that thinking there will be a quiz increases their motivation to pay attention. It also helps students remember what they learned, perhaps by as much as 30 percent. It’s even better to ask students to write down their answers before I take any oral answers so everybody gets a chance to mentally answer. But I don’t always remember to do that. Example: It’s better to use handouts that give directions in both text and graphics because students learn better when the explanation is in both channels. Elaboration: Student learning is strengthened by their making a mental map, or schema, of what they’re learning, including how it relates to their lives. Anything we can do to help students put layers of meaning on their mental map is helpful. Example: Because digital skills are psychomotor skills, I show or tell students the “executive routine” for the largest task before I teach details of any individual steps or tasks (Gagne, 1985). Having seen the executive routine even briefly, students will be better able to learn the individual steps or tasks. 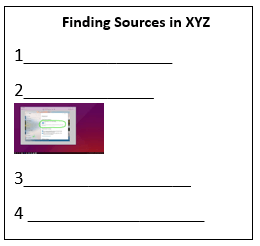 Let’s say one of your learning objectives (or all of them together) amounted to “Students will be able to find appropriate sources in the XYZ database.” You would think about all the steps they have to do in order to find those sources. Then you would show those steps to students as a numbered list before you’d teach the individual steps and their details. Example: In an effort to try to connect what I’m teaching to what students already know, I show students the executive routine and then give them one minute to note which steps they have done before. Then I ask for volunteers to tell the group. Example: I try to use their prior knowledge any way I can. For instance, I once had to teach students at 12 community colleges which nine states, all east of the Mississippi, had reciprocal agreements with Ohio for handing child support cases. Giving them a list to memorize seemed boring. To take advantage of the fact students already knew where the nine states are located, I imagined that my handout paper was the eastern half of the U.S. and typed the names where the states would be on such a map. For instance, North Carolina was toward the lower right, close to the edge of the paper. They all learned the nine state names in just a few moments. Example: I use verbal markers such as “This is important” or “This is a crucial step” or “The tricky thing about this is….” to help students pay attention right then and to also contribute to their mental maps. So that’s my list that fits here. But you must have activities that have worked for you, too, which I hope you’ll post. Thank you in advance! And let me know if I can be of any help when you’re designing instruction. Felder, Richard, and Rebecca Brent. Teaching and Learning STEM. San Francisco: John Wiley and Sons, Inc., 2016. Gagne, Robert M. The Conditions of Learning. Fourth edition. San Francisco: Holt, Rinehart and Winston, 1985. It has likely already happened to you at least once, perhaps more than once. You receive an instruction request from a faculty member, along with information on the topics or resources that they would like you to cover. As you review the information provided, your reaction ranges from concern to outright incredulity: They can’t really want me to teach them that! For me, it was the Dewey Decimal System. A faculty member who was teaching a required introductory course in his major was having his students complete a worksheet on available library resources. As part of the instruction, he wanted me to teach them about Dewey. Of course, the library where I was working at the time did not use Dewey. But even if we had, I would not have wanted to spend a significant amount of class time on the topic. While classification systems can be appropriate for instruction sessions in some cases, I knew that the chances that any of the students would be using books for the course was low. The students did not have a research assignment at that time, and it was a field that was heavily oriented toward journals, not books. I connected with the professor and explained that teaching Dewey would not work, gave my reasons, and made other recommendations for content that I thought would be more helpful to the students at that specific time in that particular program. Has this ever happened to you? Maybe you are asked to show students certain databases, when you think that others are more appropriate for the course or subject area. Perhaps you are asked to cover content that you think is inappropriate for students at the specific level. Maybe you know from past experience that the instruction session, as envisioned by the faculty member, does not engage the students in any meaningful way. When you do get an inappropriate or misguided request, don’t be afraid to push back. Use your professional experience and expertise to support your argument. Keep in mind that faculty often have only a “vague idea” of how librarians can help their students, and in many cases, “their understanding of the teacher‐librarian’s role is far different than ours.” (Meulemans & Carr, 2013). Although it can be uncomfortable, educating faculty on how the library, and librarians, can best support their students is better for all involved in the long run. Second, offer alternatives for content that you think is more appropriate. Explain why you think your proposed content will work better and will support the students in achieving the overall goals of the assignment or course. However, based on the assignment you have described, I think that class time could be better spent by focusing on the following content…This will likely be more helpful for the students, since it will give them a chance to practice skills that will be directly applicable for the assignment they are completing. In place of tool A, I think it more appropriate to show them tool B. The overall focus of the two tools is similar, but in my experience, students at this level often find tool B to be more accessible. If your goal is for them to learn how to locate a few data sources for their assignment, I think that tool B will be effective and more manageable for the students. In many cases, this initial communication will likely be all that is needed. Most faculty members will be reasonable. The “Dewey” faculty member accepted my explanation, and alternative content, without hesitation. In my experience, in fact, faculty are often grateful for the recommendations. They make their requests based on their own knowledge of what the library can and does provide, and may be unaware of the range of options that are actually available. There have been several times in the past where I have recommended giving the students instruction on how to use Zotero, and after class found the faculty member was even more excited to learn about the tool than the students. If the faculty member does continue to insist, don’t be afraid to just say no. We don’t like to turn down instruction requests, but if it is something that you really don’t think is appropriate to teach, or simply can’t teach for whatever reason, there is justification for refusing the request. Welcome to your worst teaching nightmare. You walk into a course or workshop, you have the usual amount of time to set-up before everyone has settled in and you can begin. And then it happens. 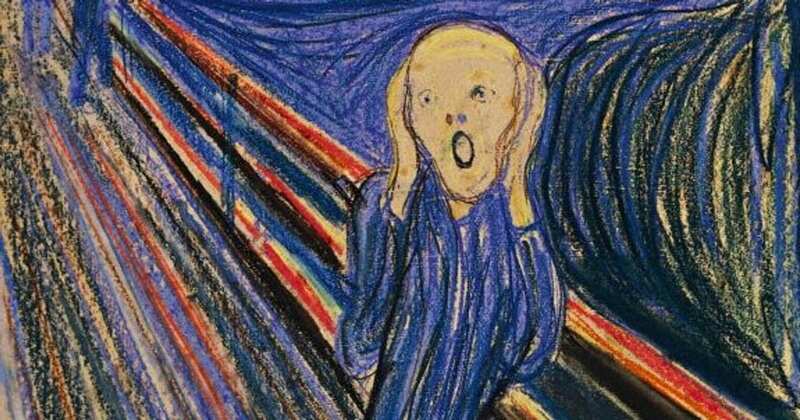 The internet is down. Your presentation for the day depended on being able to demonstrate how to access a database, how to filter searches, and to get your students actively working with you as you work through these steps. The long and short of it is, I’ve been there, and there isn’t much you can do in the moment, although all hope isn’t lost, which I will get to in good time. The good news is, this is just a nightmare, and you can wake up and take some precautions to keep in your back pocket, just in case this becomes a reality. If you have been asked by an instructor to come to a class or workshop it is nearly a guarantee that you will be heading into the web at some point, but the good news here is you can pre-record your actions! No need for fancy devices, high tech programs, or even the know how of how to make videos in order to make a recording of your already planned demonstration. As a matter of fact, the “hard work” is more than likely already done, and done by you! The first step to this process is to know what you want to show, and presumably, because you’ve spent time prepping for this course, you know exactly when and where you will depart from your presentation to the web and what you intend on showing there. 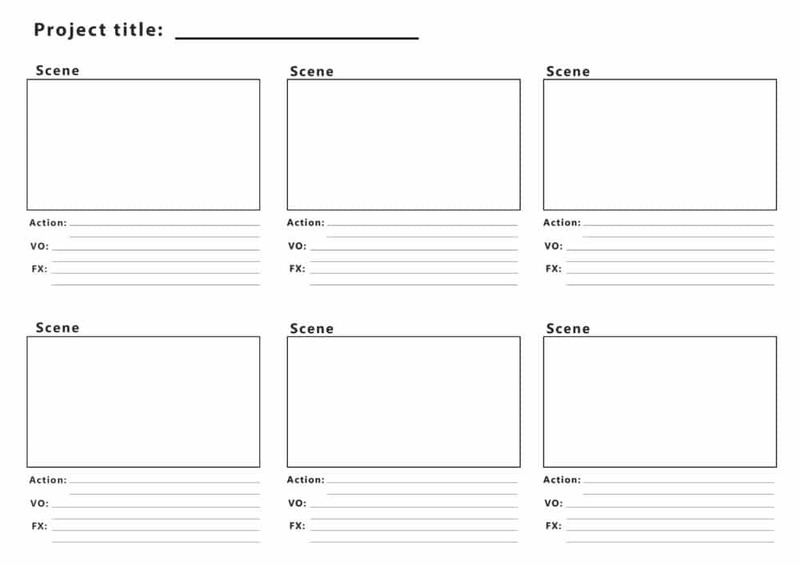 Some find that storyboarding helps this portion, storyboarding is a process of visually or verbally putting down what each screen looks like and describing the actions taken on that screen, including pauses. You can see below what a quick scribbled out version of a storyboard may look like, but there is no right or wrong way to approach this. You can go as complicated as taking screenshots for each one and typing out your plans, or scribble on a scrap of paper each step. All this is is a visual map to have before you move on to the next step, recording! There are endless technologies that can facilitate the recording of your screen, better known as a screen-capture, but I am just going to focus on a basic one. Screencast-o-matic is a free, up to 15 minute screen recorder, that has the option to add captions to all video, and will automatically upload it to either the screencast-o-matic webpage or to YouTube, with little action on your behalf. It’s finally time to record, once open Screencast-o-matic allows you to simply select the browser screen you would like to record, and begin recording with a click, stopping with another. 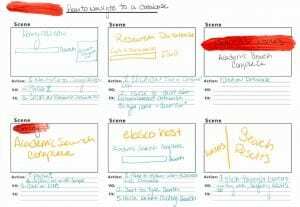 This is the point that if you created one, to utilize your storyboard as you slowly navigate through the web that you intend on demonstrating to students. You may find that it helps to speak as if you were in front of a class as you record, allowing you to time how long to pause between clicks. The goal here is not to have a fully polished video, and certainly not one with audio, but a video that once embedded into a presentation can play behind you as you narrate live. This gives you the opportunity to not just speak knowledgeably about your demonstration, but most importantly, allowing you to no longer be held captive by a mouse and screen, and go to stand before a class, gesturing to the parts they should know physically pointing to things rather than using a mouse which is poor for these purposes. Having a selection of these videos in your back pocket may seem like an intimidating task, but the amount of tension and stress they can save you in a pinch is worth it. These demonstration videos don’t have to be made all in one go, but one at a time as you prep for new classes. Keep them short so you are able to combine multiples, rather than repeating many of the steps anew just to demonstrate a slightly different process. Once you have started this process, it’s easy to make this part of your teaching, making short snippets for every use to be used in every case, or just in case. But what of getting students to practice the skills you are attempting to teach? Active learning thankfully can happen with the simple aide of a pen and paper or a whiteboard with markers. Looking to other instructors via the ACRL Sandbox, we can find in examples of in-class activities that are easy to adapt to the most basic of situations. Having one activity in your back-pocket ( or on your flash drive in your back-pocket) for each of the Frameworks you tend to teach should help you when your worst nightmare becomes reality. Let’s look to a worksheet uploaded by UCONN library, the Research Question Generator. It is focused on asking questions to make students think deeper about their topic in such a way that leads students to formulating a more structured research question. This process can easily be adapted to make students think deeper about keyword searching, having them do the hard work of playing with Boolean, and even limiters, before even touching a database. Needless to say, with a bit of forethought, your worst nightmare can just be another day in the class! Make sure to put in pauses for you to speak! Don’t share access with students or instructors if you have no subtitles or audio, accessibility standards are important. Have your videos saved in the cloud, box works well for this, and a flash drive as back up. 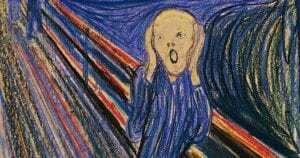 You never know when the web will be working fine but it’s a moment that EBSCOhost is down. Students tend to be very patient, don’t fret about set up time, pauses longer than you would like, or other weird quirks that can happen. They have probably experienced a similar situation and tend to have compassion. Welcome to the OSUL Teaching & Learning Blog! This blog was developed with the intent to provide advice and resources to all librarians involved in teaching, whether that be through instructional one-shots, or through specific courses, such as Arts & Sciences 2120. Here, you are encouraged to be proactive, and ask any instructional questions you might have. Have you faced new challenges in the classroom with student engagement, and need some advice on how to better reach students? Have any questions about implementing new technology in the classroom? Ask away, we’d be happy to answer and provide any advice we can. To ask your question, simply leave a comment below any blog entry you read. We’ll add new posts on the home page of this blog monthly, and if you subscribe to this page you’ll be notified of new blog entries by email. Expect answers from special guest bloggers from University Libraries, as well as members of the committee. Additionally, you’ll find various books, articles, podcasts, and other materials to provide information on how to resolve instructional problems that you may have encountered in the classroom listed within various tabs towards the top of the page. These resources have been organized around four themes: Instructional Design, Learning, Teaching Methods, and Assessment. If you are interested in writing for the blog, please feel free to contact us. You will find information about committee members under the about us tab.